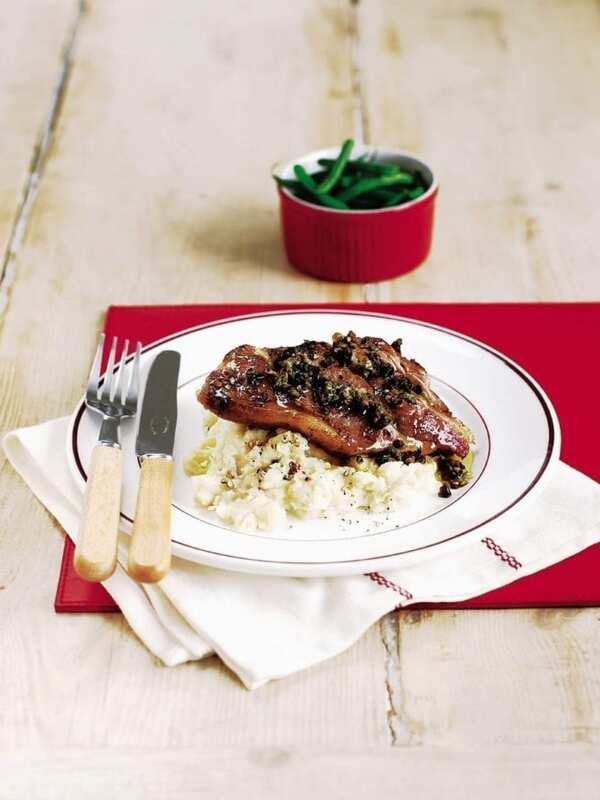 Lamb doesn’t have to be expensive, as this easy lamb shoulder chops recipe with a tapenade marinade shows. Mix the tapenade, capers and olive oil together in a small bowl. Brush the marinade over the lamb chops and set aside to marinate. Put the butter beans, stock and garlic into a saucepan. Bring to the boil and simmer for 15 minutes. Whizz using a hand blender or mash really well, until smooth. Season to taste and keep warm. Heat a griddle pan until hot. Add the chops and cook for 5-8 minutes, turning, until cooked to your liking. Spoon the butter bean mash on 4 plates, season with crushed mixed peppercorns, if you like, and place a lamb chop on top. Serve with steamed green beans on the side. Dried butter beans are a cheaper option – just soak them in water overnight before cooking. If you can’t get hold of shoulder chops you can use loin or chump chops but they are more expensive.